The Australian Speech Communication Association (ASCA) examinations are an integral part of the extra-curricular Speech & Drama program offered at Loreto Normanhurst. Students work towards the exam, held in November each year, and perform it in front of an audience made up of peers and parents. The exam is designed to help the development of oral communication and public speaking. Each exam incorporates an oral presentation on a subject in which the candidate has a special interest; readings and/or memorisations from relevant prose, poetry and/or drama, impromptu speeches and exchange of ideas with the audience, and much more. All of the 30 students who participated in the exam last November should feel very proud of their results as 15 students received a High Distinction and 15 students received a Distinction. 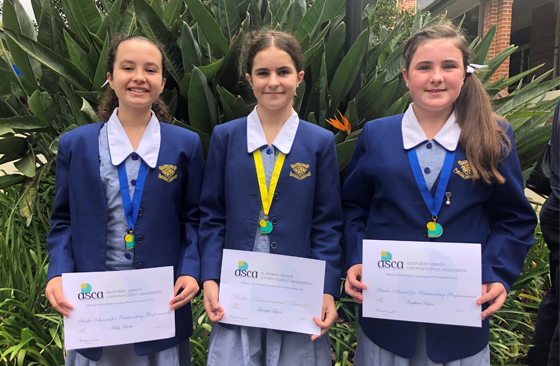 On Saturday 16 March ASCA held their annual award ceremony at Ravenswood School for Girls where students from many different studios across NSW, Queensland and Victoria are recognised for exceptional performances in their exams. I am very pleased to announce that Molly Hanly and Josephine Egan were awarded Studio Medals for outstanding exam results and Georgia Tapner and Audrey Kha were the deserving recipients of the Studio Achievement Award for consistent effort. Students from Year 5 to Year 9 who wish to enrol in the extra-curricular Speech & Drama program should send an email to Mrs Sutherland and ask for an application form. Enrolments are now being taken for semester two but there are limited vacancies so don’t delay!